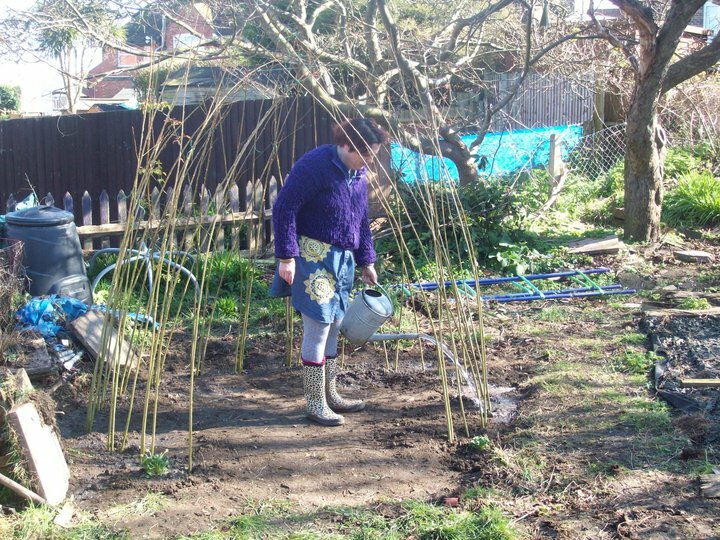 We began creating our garden back in January 2011. Initially it was just an untidy plot of tussocky grass with a narrow concrete path on one side and a tall hedge of privit on the other. It measures 65 feet by 25, and has an old apple tree and a self-seeded ash at the end with a large bay tree half way up one side. The area beneath the trees at the end is currently our garden refuse dumping ground! 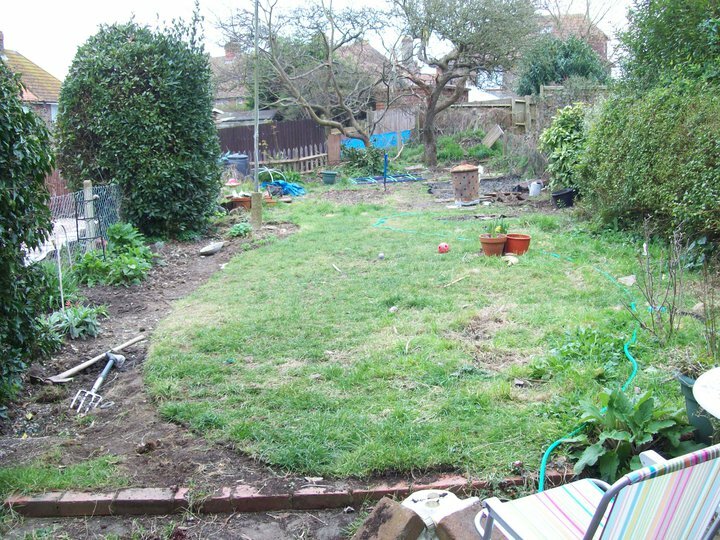 Not very tidy, but then it's good to leave a few rough edges in a wildlife garden. One of the first things we did was to dig up the horrible concrete path and replace it with a curved border. The first summer we planted this with a big patch of cosmos but as time goes on we plan to include more and more native wildflowers. Half way up the garden, on the right hand side, we then began the massive task of digging a pond. This was to include a wet meadow border, a gradually sloping edge, a shelf for marginals and a small, deep recess in the bottom. Once dug we then had the exciting but frustrating wait to find enough old carpet to line the hole! 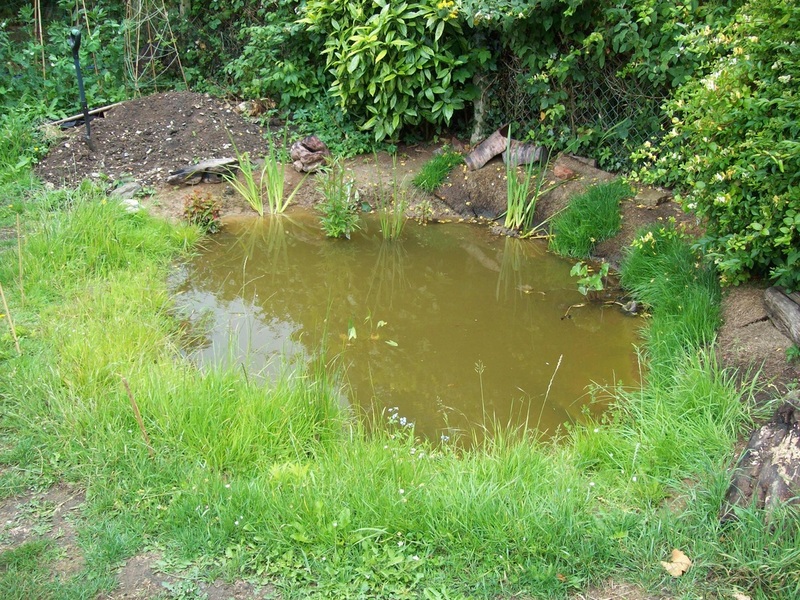 Finally the butyl liner went in, and in early May the pond was filled, and we began to add the wet meadow border using left over pieces of turf and the poor subsoil that was excavated from the pond. From here it was just a matter of gradually finishing the turfing and beginning to add native water plants. These included plenty of oxygenating weeds which help keep the water clear including; hornwort and water crowfoot, plus several marginal plants; yellow flag iris, marsh marigold, purple loosestrife, and flowering rush. Within the wet meadow border we added water forget me not, water mint and brooklime. As the weeks passed frogbit and arrowhead were also planted. the joys of water in a wildlife garden. Swinging away from the damp pond edge we've left a broad strip of grass to grow tall beneath the hedge. There's already a nice colony of wild primroses growing here and we hope to add other wildflowers as time goes on. I've wondered whether the soil here maybe too rich so it might be an idea to replace it with poorer subsoil in the future. 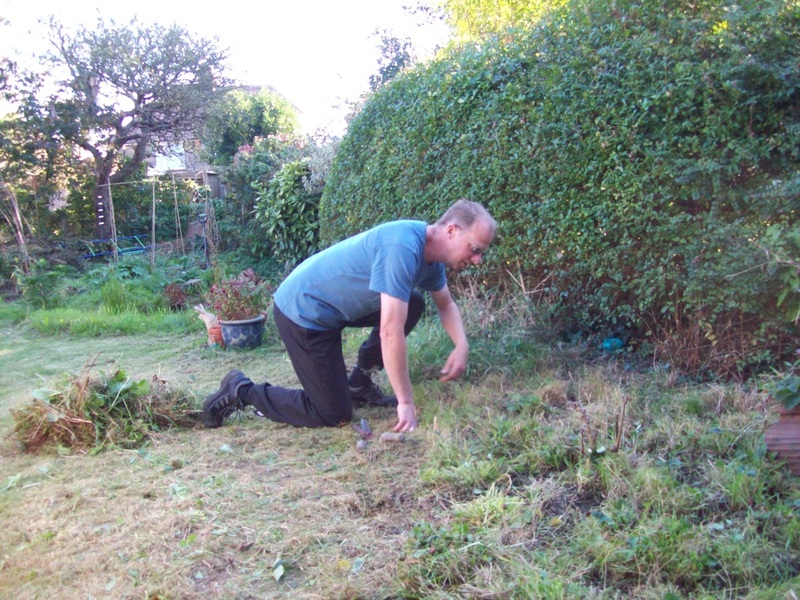 The photo to the left shows Martin clearing it in the autumn. At the very end of the garden we decided to grow a willow rod dome; the idea being we could sit here with a good view of the pond. We planted them early 2011. Alas, the extra dry spring that followed meant the rods failed to root. Luckily a friend has kindly given us a fresh batch of rooted saplings; very small but healthy, so hopefully it wont take long for the structure to green up. 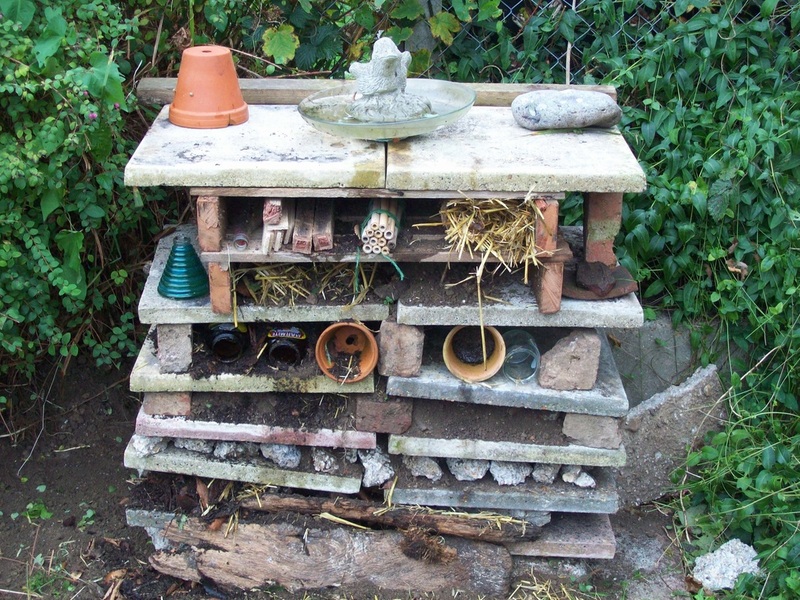 As well as a small vegetable plot at the end of the garden, a compost heap and the all important bird feeding station we've also built a little bug hotel. We'll tweak this as time goes on. It also provides a handy seat! So that is a brief introduction to our garden. The secret to a good wildlife service station is the amount of differant habitats it provides and the variety of native plants it harbours. We created ours over the span of one year, but of course, this is very much the beginning.